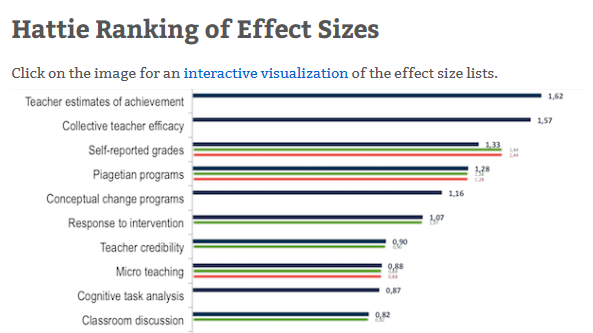 Hattie says effect sizes� are the best way of answering the question - what has the greatest influence on student learning?�. With an average effect size of 0.4, Hattie finds the effect size of Teacher Estimates of Achievement is 1.62. This highlights the critical role teachers� belief in students plays in student achievement. Research has long shown that if teachers have lower expectations for students it results in lower grades being achieved. A recent study founds boys and girls who start school with the same behaviour problems end up in markedly different places down the line. Boys in this group achieve much lower grades indicating teachers respond differently to bad behaviour based on gender. How can we ask students to believe in themselves if we do not believe them? The growth mindset has evolved as a way for teachers to focus on student potential, rather than their deficits. In a growth mindset students believe that their most basic abilities can be developed through dedication and hard work � brains and talent are just the starting point. This view creates a love of learning and a resilience that is essential for great accomplishments (Dweck, 2013). It is the job of teachers to see the potential in all students and help them achieve that potential. There are many students where we feel we can�t get through but as a teacher it is our job to believe in those students and try new strategies.